The huge sanctuary of the World Harvest Church in Columbus, OH, which is capable of accommodating 5,200 people, has just been equipped with an all-new NEXO GEO T Series tangent-array sound reinforcement system, purchased without an actual demo, purely on the recommendation of system designer Bob Owens. In the opinion of Owens, "it's the best-sounding rig I've ever installed." 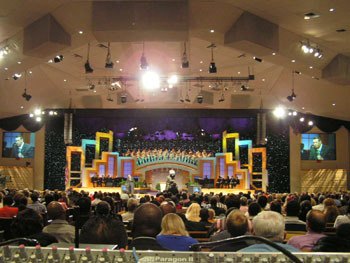 The World Harvest Church has been the home of a number of branded sound systems since it was built in 1987 to house the growing ministry of Pastor Rod Parsley. No system has proved adequate to the task of serving a 5,200-strong congregation in an awkwardly-shaped hall, according to sound engineer Michael Caldwell. Sound designer and installer Bob Owens, from Owens Audio Video Design in Orlando, FL, surprised the in-house technical team with his recommendation of a NEXO GEO T system. "Some of us had experience of the older NEXO products, but the GEO T was totally new to all of us," says Caldwell. "The results are incredible-sounding, completely unmatched by anything we've had in that room before." 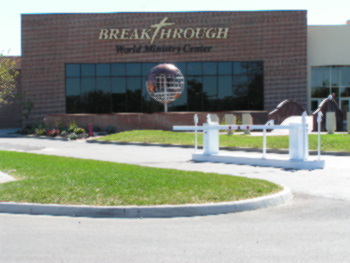 The World Harvest Church has a very substantial musical component to its services. On Sundays, the first 40 minutes of the service can be music-based, with a 70-member choir and a 10-piece band on stage. Even for smaller weekday services, there are 11 individually-miked singers on stage. For such performances, Bob Owens has specified a left and right configuration of GEO T cabinets, with each array containing 10x T4805s full-range compact speakers and 2x T2815 downfill boxes. The bass bins are flown behind these hangs: 3x CD18s per side, with a fourth bin on the stage. 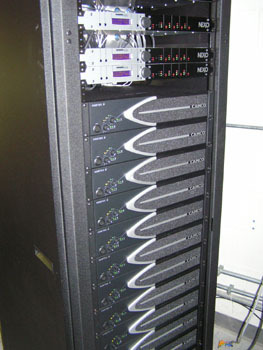 A total of 7x NEXO's new NX242 digital processors are used to manage the front-of-house and monitoring systems. "I was amazed by these CD18s," says Michael Caldwell, "you can go from the front row all the way to the last row, and still feel the low end, which sounds the same. Do we really need eight of them? I don't know but it sounds really really good!" There's much more NEXO product on stage. The Church is already using some PS15s for stage monitoring, and is preparing to change over completely to the PS Series. Additionally, flown out in front of the choir loft are 5x GEO S805 plus 1x S830 boxes each side, with an S2 sub. These face out to the crowd, and act as rear monitors for Pastor Rod Parsley, who prefers not to hear the source of his monitoring, "he just wants to be wrapped up in it," according to Michael Caldwell, who is in charge of front-of-house sound. Both FOH and monitor engineers are mixing on ATI Paragon II consoles. 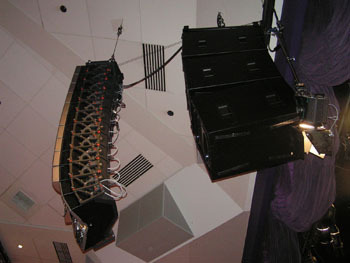 Amplification for the front-of-house PA is provided by 14x CAMCO Vortex 6 amplifiers, whereas the monitor system is powered by the Church's existing stock of Crown amplifiers. Unable to arrange an in-situ demo of the GEO T cabinets themselves, Bob Owens arranged for GEO S Series cabinets to be brought in to augment the Church's existing system for their annual Conference. "The GEO S were great, and Bob assured us that the GEO T would sound even better," says Caldwell. "It's a tricky room because it is shaped like a squished octagon, and has a lot of angles. We're still working on a couple of dead spots, where the seating area spreads beyond the pattern of the GEO Ts and will probably invest in some GEO S boxes to cover these areas. But we are all convinced by the evidence that NEXO can keep up with and beat all the systems from those manufacturers that we'd already heard of, even though it isn't yet well known here in the USA. It's the first time that I've heard a system in this room that can cover so evenly from front to back. We don't lose any of the volume, and more importantly, we don't lose any of the feeling." The Church technical team praised the contribution of Owens Audio Video Design, which was helped in the installation by engineers from Thunder Audio, which has a sizeable touring inventory of NEXO loudspeakers. "Bob Owens has been prepared for everything," endorses Michael Caldwell, "he's been a step ahead of the game all along." System designer and installer Bob Owens declares the World Harvest Church to be "a perfect application for the NEXO GEO T rig! I had recently demoed a GEO T system in Colorado for another large church, and knew that it was the answer here. Pastor Parsley is an extremely dynamic speaker, and was really unhappy with his sound, even after three different systems had been installed. I was invited to the Church as a recommendation from another Pastor, (Clint Brown of Faithworld), just before their annual Church Campmeeting. Pastor Parsley asked me to help him, so, with one week's notice, we decided to rent some GEO S systems to run as delays speakers in the room. That really showed everyone how the GEO technology works. It gave us an opportunity to compare the conventional rig to the Nexo Curve Linear Arrays. It was as different as¡­ night and day, and that seems to be the common reaction from most of the people that hear it." Bob continues, "the installation went much faster that any of us anticipated. It started Monday morning at 9am removing their existing system, and we were playing CDs through the GEO T¡¯s and celebrating Tuesday night. Church audio technicians Mike Gregory and Michael Caldwell worked closely with the Owens AV design crew and the riggers from Thunder Audio. "I wanted to mix on the system, and give it the real test run! The first thing we all noticed was almost all of the console EQ could be removed. Instruments and vocals were 'in your face'. The drums, and especially the bass guitar was so fat and present that no one could believe it. I understand the church is really happy with this design, and I think it¡¯s the best-sounding rig I¡¯ve ever installed."